In response to an email to the ARMA Research Impact Special Interest group, there was a desire within the community to find out how the REF 2014 case studies were to be used by Universities. The results of a survey designed to address this question can be found in the summary report. This resonates with one of the Research Impact Network’s current themes around ‘Communicating Impact’ and provides lots of food for thought in terms of how the sector is taking this forward. This entry was posted in Uncategorized on June 20, 2014 by Research Impact Network. Whilst we’ve adopted these themes to organize our conclusions, they are not mutually exclusive concepts – in fact they are interlinked. In order to capture information about research impact, we need to promote a culture which rewards and recognises it as central to the mission of Universities and embeds systems and processes to facilitate and record examples of impact. Communicating impact in engaging ways will promote a sense of how research has managed to achieve impact, and provide us with information about typologies and pathways to feed into our processes and systems for capturing impact. What does the ‘ideal’ look like, and what is stopping us from getting there? The approach that we’re taking is pragmatic; focussing on some of the practical steps that we can take to improve our own practices. Whilst we suggest below what the ‘ideal’ looks like, it is there as a prompt to start the discussion, to identify what might be getting in the way and to think about the initial steps that we might take towards removing or working around barriers. We hope that this will form the basis for future work for the Research Impact Network, in the form of future conferences, research projects, publications or good practice guides. These topics are not exhaustive though. In the meantime – the full report can be downloaded by clicking on the link below, and your feedback and comments would be very welcome. What does the ‘ideal’ look like? Clear and unequivocal notion of ‘impact’ which is not just about REF. Academic colleagues understand what constitutes ‘impact’. Senior managers provide leadership and infrastructure. Stability over time to develop enduring systems/processes Institutions can articulate the broader benefits of research in ways which are appropriate to different audiences. A ‘virtuous circle’ of activity where impact case studies are beneficial to other areas of the University and can be used to attract future funding. What is stopping us from getting there? Impact is perceived negatively and narrowly in terms of the REF reporting requirements. Impact is no longer a strategic priority now that institutions have completed their submissions for REF 2014. Lack-of-co-ordination. Too many different systems/processes. Potential for impact not necessarily identifiable as a project/publication. Technological solutions not keeping up with requirements for impact. Technological solution requires commitment and understanding in order to use it appropriately. Resources and skills needed to be able to craft impact case studies effectively. 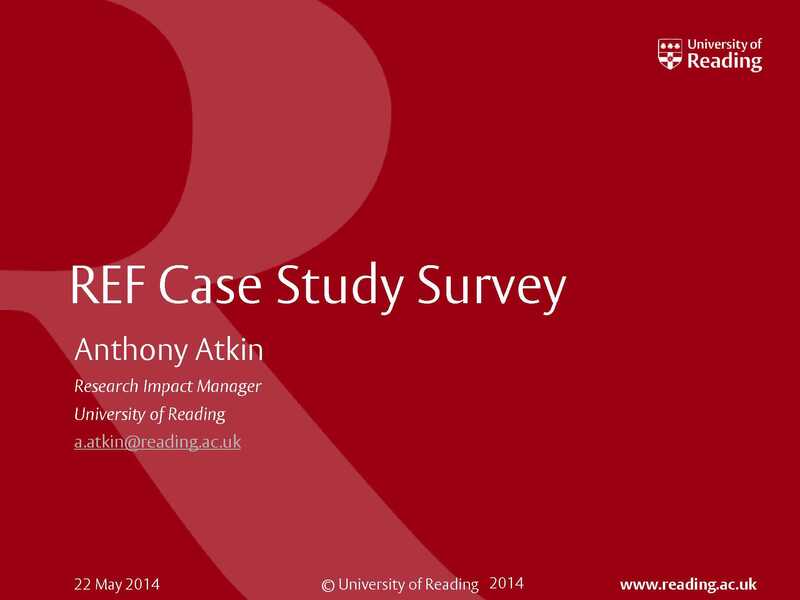 We are yet to discover what a ‘good’ REF Impact Case study looks like. What would we like to see put in place by our institutions/funders? Appropriate reward and recognition. Case studies are used in numerous ways including marketing and recruitment. Institutions have coherent impact strategies which involve colleagues (academic and other professionals) across the institution. HEFCE/Research Councils use impact case studies to promote the broader benefits of research. Early communication and consultation with regard to impact reporting requirements. Coherence around the nature of ‘impact’ between HEFCE and Research Councils. Leadership and support for implementing systems and processes to capture impact. Bring together communications professionals with research offices and academic colleagues to work on impact case studies. HEFCE/Research Councils use impact case studies to promote the broader benefits of research. What can we do within our own institutions? Promote ‘impact awards’. Either establish competitions within our own institutions or encourage applications to national competitions such as those organised by ESRC or PraxisUnico. Work with Impact Champions as a catalytic group to promote engagement/impact. Finding creative solutions (e.g. media students working on impact case studies). Influencing upwards and being the drivers for change. Increase knowledge of social media, search-engine optimisation and altmetrics. Educate colleagues in the use of impact capture systems. Collect material for case studies on a more routine basis (not just for the REF). Develop relationships with editors of online publications such as ‘The Conversation UK’. Involve beneficiaries and end users of the research in case studies. Showcase research impact stories via a range of media, including websites and brochures. What can we do collectively? 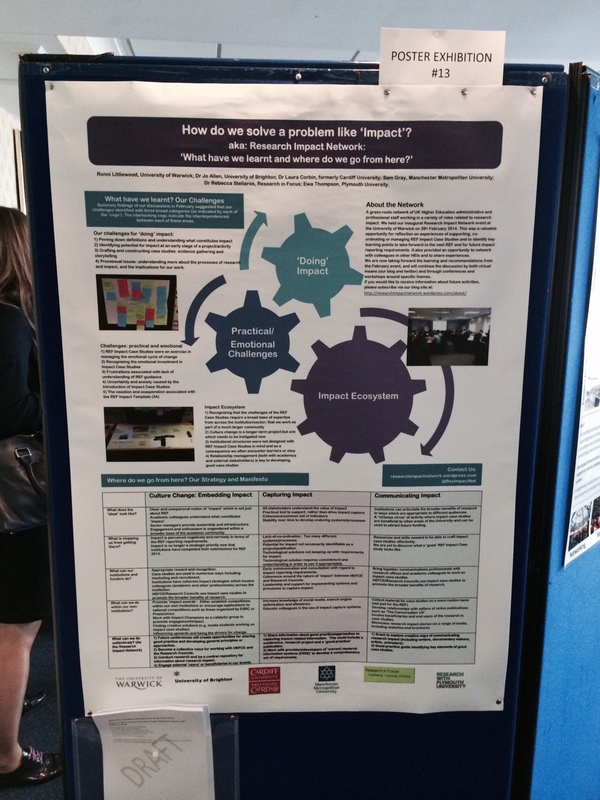 (As the Research Impact Network) 1) Future conferences will create opportunities for sharing good practice and developing general principles or approaches. 2) Become a collective voice for working with HEFCE and the Research Councils. 3) Conduct research and be a central repository for information about research impact. 4) Engage external ‘users’ or beneficiaries in our events. 1) Share information about good practice/approaches to capturing impact related information. This could include a conference, research project and a ‘good-practice’ publication. 2) Work with providers/developers of CRIS: develop a comprehensive set of requirements. 1) Event to explore creative ways of communicating research impact (including writers, documentary makers, artists, animators). 2) Good practice guide identifying key elements of good case studies. Our summary outcomes table has also been on tour to the ARMA Annual Conference in Blackpool and the PraxisUnico Conference in Cardiff, and has attracted considerable interest from delegates at both events. This entry was posted in Uncategorized on June 19, 2014 by Research Impact Network.